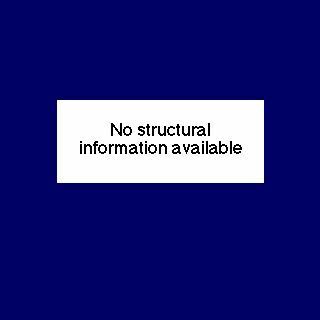 Roentgenium atoms have 111 electrons and the shell structure is 2.8.18.32.32.18.1. The ground state electronic configuration of neutral roentgenium is [Rn].5f14.6d10.7s1 (a guess based upon that of gold) and the term symbol of roentgenium is 2S1/2 (a guess based upon guessed electronic structure). Roentgenium: description Your user agent does not support the HTML5 Audio element. Roentgenium, was discovered on 8th December 1994 at the GSI in Darmstadt, Germany. The interested reader should consult the on-line version of Creating Super Heavy Elements for a fascinating insight into research on "super-heavy" atoms. Chemically, roentgenium should be in the same group as the elements copper, silver, and gold (Group 11). The solid state structure of roentgenium is: bcc (body-centred cubic). Element 111, roentgenium, has no biological role. Reactions of roentgenium as the element with air, water, halogens, acids, and bases where known. Binary compounds with halogens (known as halides), oxygen (known as oxides), hydrogen (known as hydrides), and other compounds of roentgenium where known. Bond strengths; lattice energies of roentgenium halides, hydrides, oxides (where known); and reduction potentials where known. Roentgenium was discovered by S. Hofmann, V. Ninov, F. P. Hessberger, P. Armbruster, H. Folger, G. Münzenberg, and others in 1994 at Gesellschaft für Schwerionenforschung (GSI) in Darmstadt, Germany.. Origin of name: the proposed name roentgenium has yet ot be accepted formally, but lies within the long established tradition of naming elements to honour famous scientists. Wilhelm Conrad Roentgen discovered X-rays in 1895. 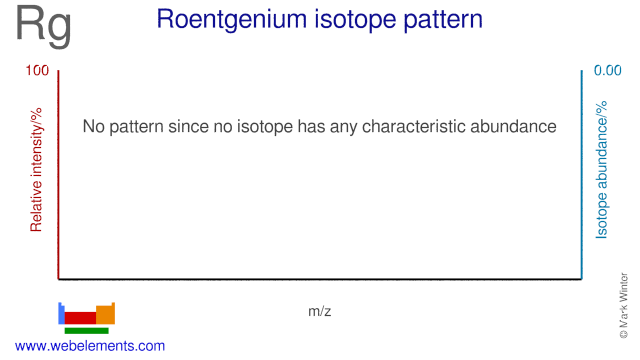 Isotope abundances of roentgenium with the most intense signal set to 100%. Isolation: only a few atoms of element 111, roentgenium, have ever been made through a nuclear reaction involving fusion of an isotope of bismuth, 209Bi, with one of nickel, 64Ni. Isolation of an observable quantity has never been achieved, and may well never be.